The Kiwi was too strong for Olivia Piana (silver for France), Terrene Black (bronze for Australia) and Fiona Wylde (copper for Team USA), matching her victory in last weekend’s marathon and earning Team New Zealand a second gold medal and valuable points on the leaderboard of nations. One of the real stories of this year’s event has been the increased size and talent in the women’s field. But despite the elevated level on the start line, nobody could match the world number one around the a course that favoured raw paddling power & speed and minimised any chance of bad luck due to the almost complete lack of waves. 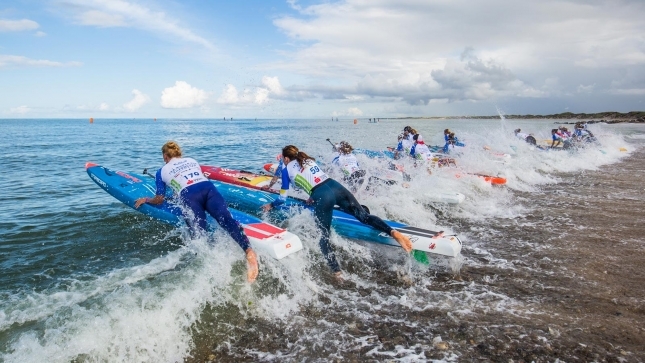 Terrene got the best of the starts, sprinting off the line to reach the golden buoy ahead of Olivia and Fiona, while Canada’s Genna Flinkman also had a blinder of a start and almost stole the money shot from the big names. Annabel had a shocker of a start and had to work back through the middle of the field. But in a sign of just how quick she is, the champ was already up into fifth place by that first buoy turn on the top end of the course. Shadowed by France’s #2 Amandine Chazot as the top dozen or so women bumped rails in a tight opening lap, Annabel pushed her way forward and quickly caught up with Terrene and Olivia. 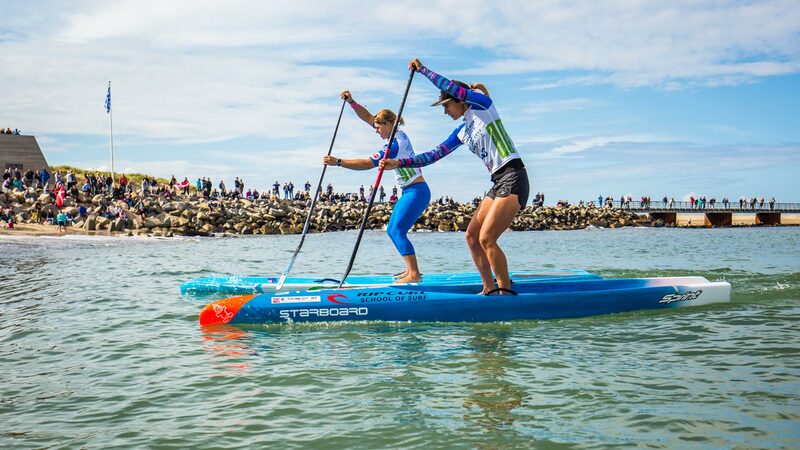 She was in third at the inside buoy on the first lap, and by the time the leaders had run the first of the beach chicanes to start the second lap, the Kiwi was side by side with Terrene and Olivia. At the end of the second lap, Annabel was a clear leader and would never look back, first extending and then maintaining her lead all the way through the third and fourth laps to win by 37 seconds. 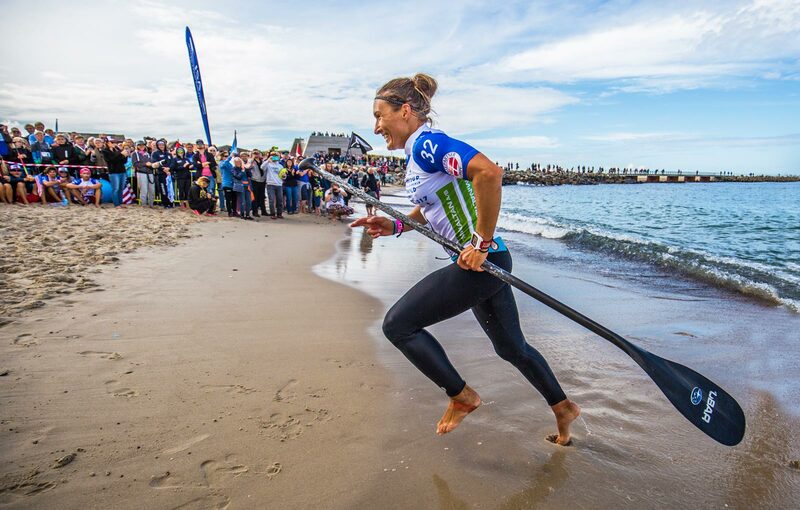 It was another masterclass from the famous New Zealander, and despite the strong surge in talent at this year’s event, Annabel has once again refused to let anyone take her title as the fastest woman on the water. The new beach race gold medalist won by a similarly-comprehensive margin in the marathon race seven days ago, and she could very well have been a three-time gold medalist if it wasn’t for a broken paddle in the sprint qualifiers. In the close battle for the silver medal, it was a see-sawing encounter between Olivia and Terrene, who seemed to be in a race of their own after Annabel took off and Fiona dropped off the back ever so slightly. There was more at stake here than just a silver medal: France and Australia have been locked in an epic battle for the overall teams champion title (along with New Zealand), where quite literally every place could make the difference. 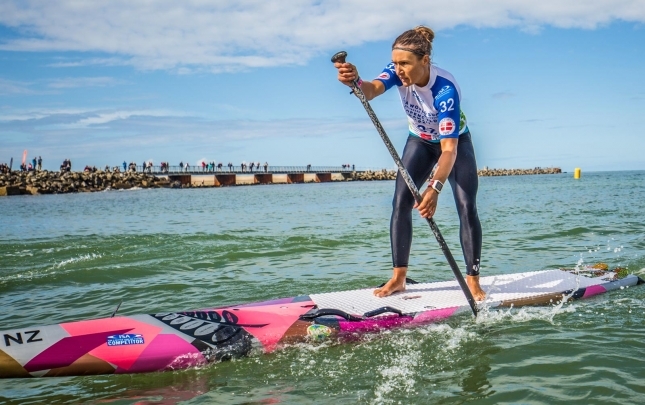 With her silky smooth technique, it was the Frenchwoman who proved too good, with Olivia crossing the line 12 seconds clear of the Aussie to claim her fifth individual silver medal at the ISA Worlds and sixth overall after her bronze in this year’s marathon. That gave France one up on the Aussies, however Team Australia’s supreme dominance in the prone may still be enough to get them over the line. Fiona was stuck in no-woman’s-land for much of the race, fighting hard but never able to fully close the gap on the top three. Crossing the line about 30 seconds after Terrene, Fiona collects her second copper medal of the 2017 Worlds to cap off a memorable week for the world number two. One of the most impressive performances came from Team USA’s junior prodigy Jade Howson, who had an uncharacteristic fall at the first buoy and spent the next two laps working back towards the pointy end of the field. Jade turned 15 just three weeks ago, and although she was one spot outside the podium today, the pocket rocket showed more than enough talent to suggest she’ll be standing on many podiums in the not-too-distant future. 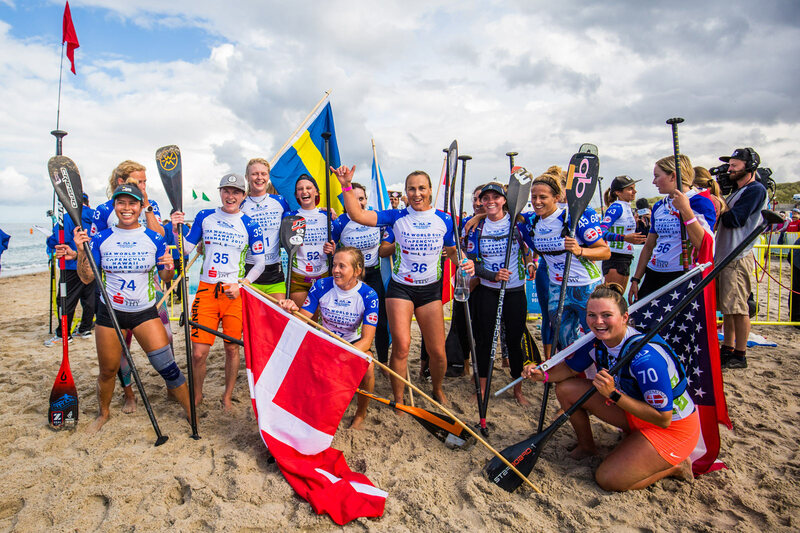 Though after doing the hard work of getting back up to fifth, Jade almost made a second costly mistake after dropping her paddle at one of the buoy turns, which momentarily gave fellow young gun Annie Reickert (Hawaii), Spain’s Laura Quetglas, Japan’s Yuka Sato and France’s Amandine. All of those women in the lower half of the top 10, in particular Annie who finished 6th, were looking sharp and doing their teams proud in what was an extremely competitive field (58.0% on the Race Index). Annie was briefly up into fifth and showed that her great result in Hood River last month was certainly no fluke. If the rise in women’s participation and talent has been one of the headlines of this year’s ISA Worlds, then the sub-headline will certainly be the surge in youth talent that young women such as Jade and Annie are leading. Yuka once again showed she’s a dark horse to watch after crossing in 7th, while Laura did Team Spain proud with an 8th place finish. Spain would have two women in the top 10 when Susak Molinero crossed the line moments later, with Amandine splitting the team mates to give Team France a top 10 double as well. Team USA trumped that effort though, with Fiona’s fighting effort and Jade’s miraculous comeback earning them a rare top five double. Congrats to the medal winners, and well done to all the women that made this year’s final. There were too many excellent performances to mention, but we’ll have plenty more coverage over the coming days. For now, scroll down to get the full results, and hit up the official event site for more coverage.